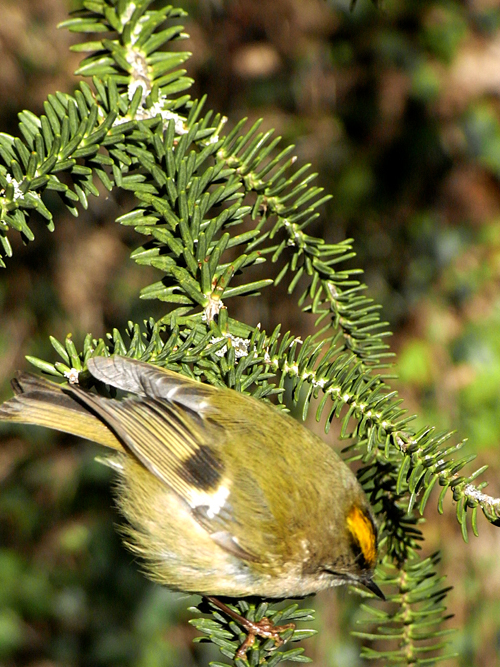 Screenprint of Goldcrest by Mark Greco. The day started with glorious sunshine. I had showered and after hanging the towel on the line walked towards The Hide to explore the grounds. Walking through the main barn’s exit towards the river I habitually managed to startle a couple of grey wagtails and a dipper which pipped and warbled along the bank -the grey wagtails bobbing as they went whilst the dipper hugged the surface of the river with usual determination. The wind was still pretty strong and intermittently blew through the branches of the Hazels and Conifers along the riverbank. There was no grey heron to be seen and even the usual mallards seemed to be giving things a miss on this stretch of the river. 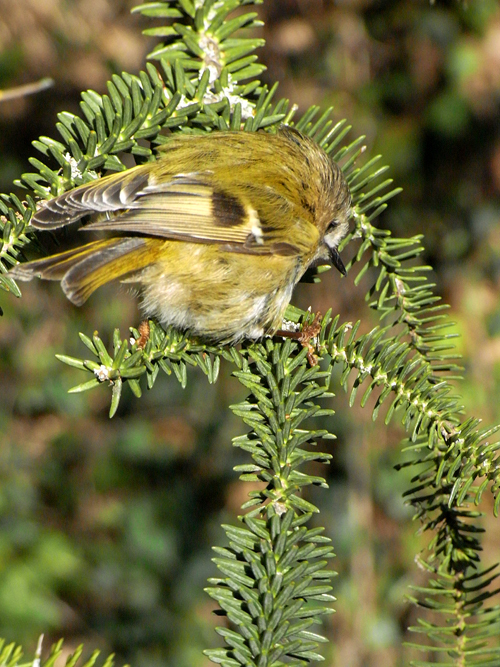 Things seemed to be quiet on this sunny morning but deciding to head back my eye caught a small bird busily hopping around the branches of a self-seeded conifer which grew on the canal side of the narrow path between the mill and the river. 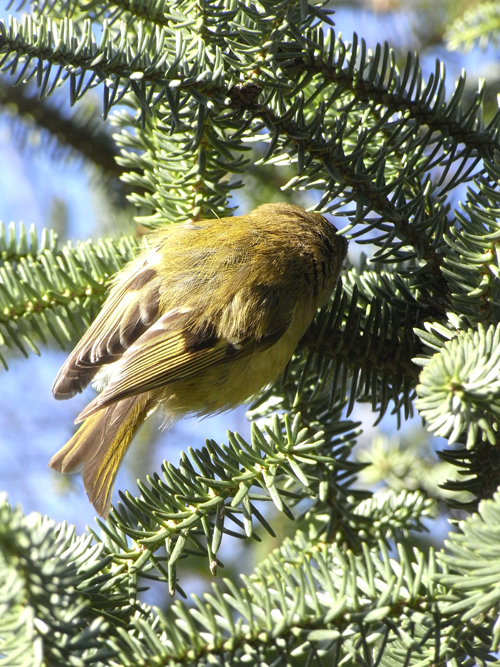 The bird was alone and as I tentatively approached it didn’t appear to be either aware or indeed mind my presence. 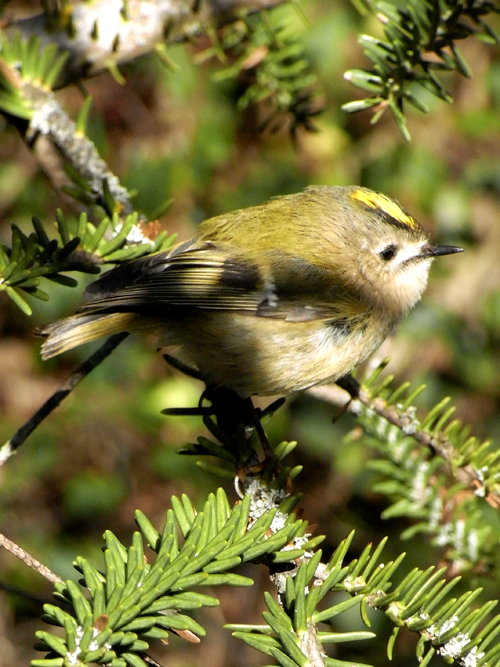 Looking through the binoculars I spotted that it was a small solitary gold crest (Regulus regulus) – one of the smallest indigenous birds to be found in Europe and certainly one of my favourites. 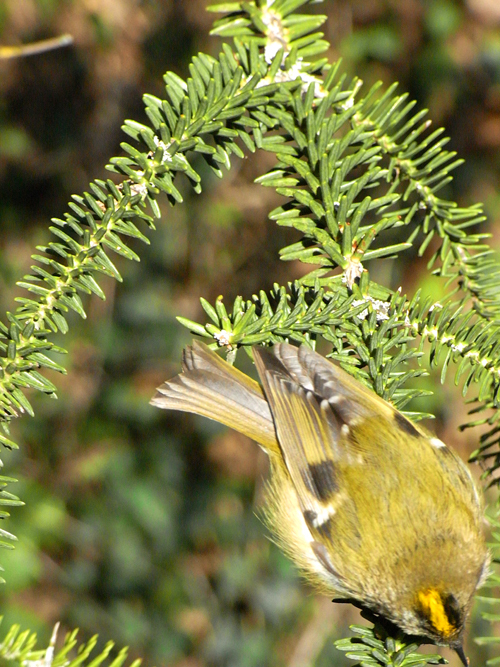 The light at that time of the morning couldn’t have been better as it illuminated the bank, the tree and indeed the goldcrest in a crisp yellow light. Being only around a couple of metres away I intently watched the bird as it explored the branches for the insects that could be hidden between the needles and crevices. From time to time the wind blew the branches quite violently causing the bird to rock and sway so much that it clutched its perch as a fisherman might do when being rocked in a force 10 gale. Amazingly I managed to get a few good photographs of the bird and this privileged experience stayed with me for the rest of the day. 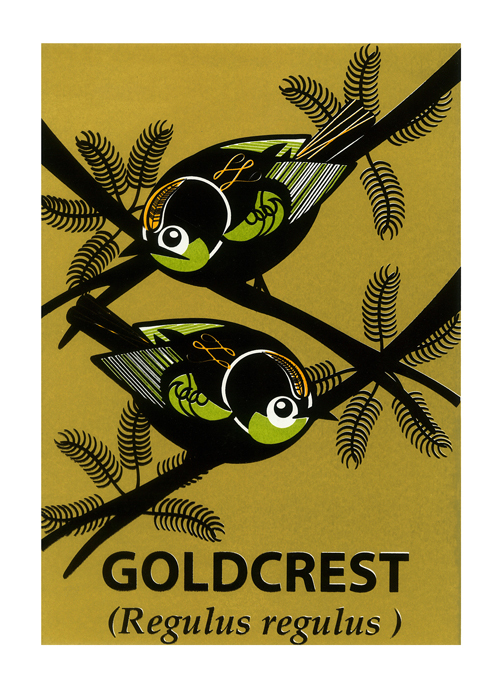 A very limited screen printed edition of GOLDCREST has been produced and prints from this edition are still available. If you’d like to find out more please contact me at info@anaturalhistory.co.uk. This entry was posted in wildlife blog by markgreco. Bookmark the permalink.